Do You Look for Travel Clues? When you find records of your ancestor that indicate he or she “made out a statement” before an official, try and determine where your ancestor lived at the time and where that official was authorized to act and where the statement was witnessed or acknowledged. An 1868 statement signed by my ancestor who was living in Hancock County, Illinois, was acknowledged before a Justice of the Peace in Linn County, Iowa. In this case, it was not a huge clue but it did document his travel there to assist in the settling up his mother’s estate. Some times knowing that a person traveled from one place to another is a big clue. Other times it is not. But looking at details in document for all the little things they might reasonably infer is always a good idea. 1850 Census St. Clair County, Michigan, Port Huron Township, p. 201. We are excited to offer this new class on using US census records as a download set. Virtually every US genealogist uses census records, but not everyone is aware of how those records can be maximized for what they do contain. There are limitations to these records, but there are advantages to them as well. If you’ve wondered if you are getting the most out of US census records, this class is for you. Order today for $45. Also included is a pre-session on organizing online census searching. Your order includes four presentations and handouts. Our approach is laid-back, down-to-earth, and informal while providing accurate information and analysis. You’ll be sent an email immediately after your purchase has processed. That email will include download instructions. Downloads must be done within 24 hours of purchase. Presentations can then viewed as many times as you want and are for personal use only. There is no streaming of our products. have you considered all alternate spellings? have you double checked what you put in the search boxes (right names in right boxes, no boxes with information from “old searches,” etc.)? 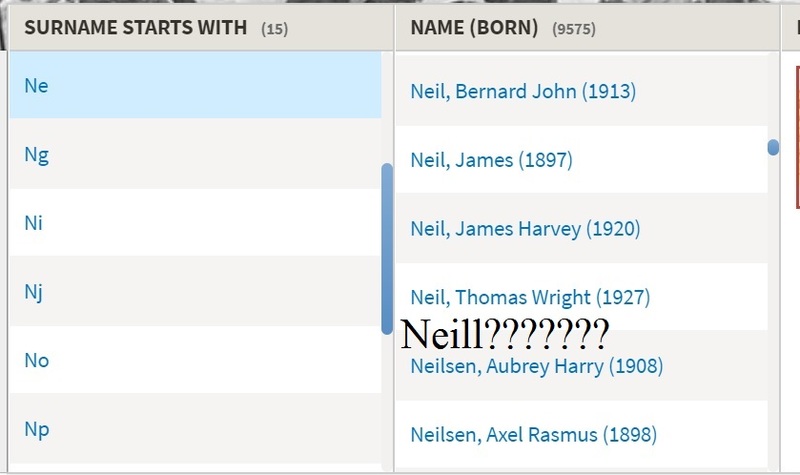 could the person be in the record under a different last name (step-father, new husband, etc.)? have you used wildcards to expand your searches? are you certain the person really should be in the record? do you know how the original records were organized and preserved? have you performed a manual search of the records? have you asked someone else for a suggestion? In most US census records when an individual is indicated as working on their “own account,” it generally means that they are not an employees and that they do not employ others as well. Learn more about US census instructions on the US Census Bureau website. Before you react to a document, interpret it, analyze it, and decide “where to go next,” make certain you have read every line of the document. Don’t just react to the “big” obvious things as it often is the details that seem trivial that can be the most important. Better yet…don’t react immediately at all. That’s when some of the biggest mistakes are made and the biggest clues overlooked. Local newspapers are not the only place to look for ancestral tidbits. In December of 1916, Albert Cawiezell of Davenport, Iowa, advertised that he was willing to exchange one 22 caliber rifle for skunks or ferrets. Aside from the colorful reference, it indicated where Cawiezell was living at the time the advertisement was placed. In some situations that could be a big clue. Cawiezell didn’t want just any skunks. He wanted scentless skunks. There’s an online anonymous list of four generations of descendants of an ancestor of mine who died in Kentucky in the 1840s. I’ve used it as a clue to names and relationships. It does have errors–there are death dates that I can’t validate, locations of events that are completely incorrect, incomplete lists of children, and marriages that were not discovered. 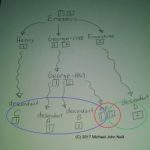 The names of the beginning ancestor’s parents cannot be validated with any record whatsoever, but the relationships in the succeeding generations were pretty much on the mark-aside from a few children who apparently were overlooked. But it gave me an outline to use as a starting point. It did not give me a tree to copy without questioning any of it. When searching old newspapers for obituaries, consider searching for the woman’s maiden name. 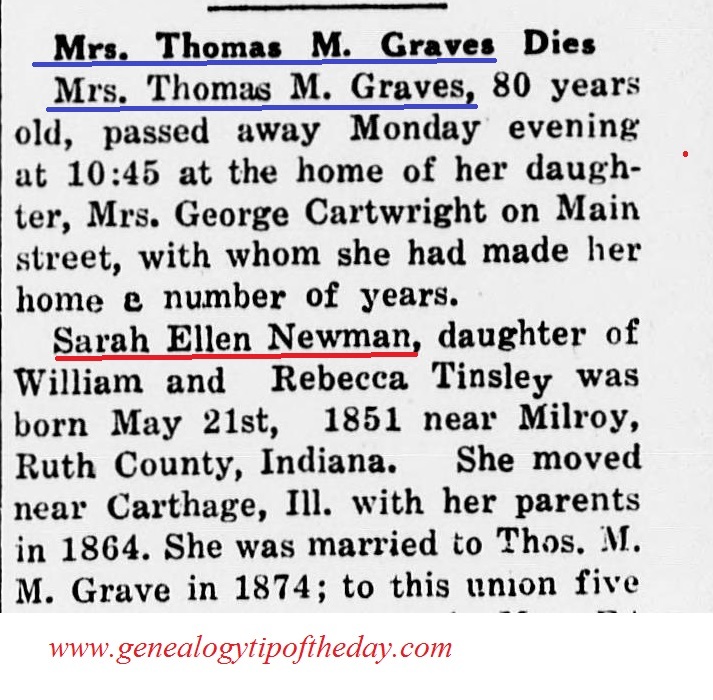 The 1931 obituary of Sarah Graves in a Macon, Missouri, newspaper refers to her twice: once as Mrs. Thomas M. Graves and once as Sarah Ellen Newman (her maiden name). About every other reference to her is “she.” Not all obituaries will list a woman the way Sarah is in this obituary, but it was a common practice during this time period. Searching for parents’ names as well may be a good idea–even if they had been dead for fifty years and had never lived in the area. 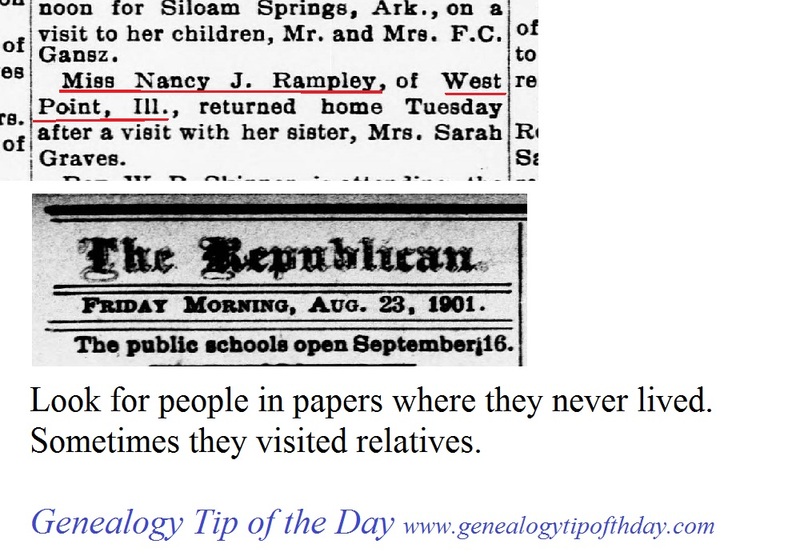 Always search for people in newspapers where they never lived–especially if you think they had relatives who lived there. References to them visiting may provide significant relationship clues. Remember that papers in towns where they were visiting may get details incorrect, particularly about the person from out of town. Nancy was actually a Mrs. (widowed to be precise) and technically in 1901 had not moved to the big town of West Point, Illinois, yet and was still living closer to Breckenridge. Including the website where you obtained a digital image of a record is a key part of the citation process. Usually including the title of the database and the “main name” of the website (www.familysearch.com, www.ancestry.com, www.fold3.com, etc.) is sufficient. Web addresses that are 24,000 characters long as a part of a citation are not practical and they often change anyway. Different websites may have images of varying quality and using more than one site may be advised. Not including the site you used may end up confusing you later if you need to go back and look at more images. You want to know where you got the best image.